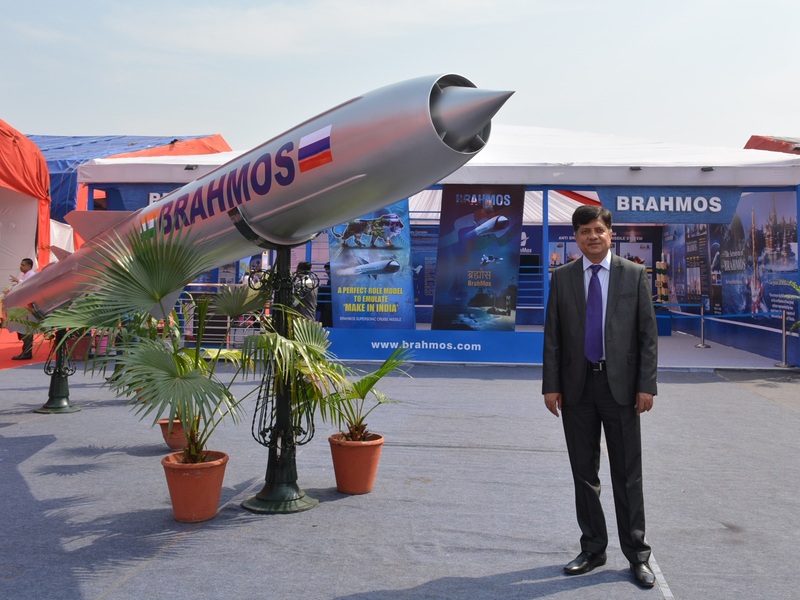 NEW DELHI: India's BRAHMOS supersonic cruise missile, developed with Russia, is gearing up to achieve a 90-degree steep dive capability that could be a game-changer, BrahMos Aerospace Chief Executive Officer and Managing Director Sudhir Kumar Mishra said in an exclusive chat with Arming India here. At present, BRAHMOS missile has demonstrated a 70-degree steep dive attack capability to target enemy positions behind a mountainous terrain. A missile regiment with such a capability has already been approved for the Indian Army and orders placed with BrahMos Aerospace. The 90-degree steep dive capability, once achieved, would provide India greater strike rate to target enemy assets at the full 290-km range, and directly overhead. What's been left unsaid is that this capability enables BRAHMOS to be used as a carrier-killer, if need be. Tell us more about the steep dive BRAHMOS, which, you were saying, is not just the steep dive variant? In May 2015, we conducted the flight test of BRAHMOS land-to-land version. The range was more than 250 km. As you know, we don't have such a long test range available on our main land. Earlier, we used to do the flight tests from Balasore towards any point in the sea, and by the help of software and telemetry system, we could know that the missile has hit that particular point. But for the Army, they were talking about a precision hit. They wanted to see if we have a target, then where the missile will go and hit it. For that purpose, we wanted a longer test range, which is not available anywhere on the main land. There are limitations in Pokhran (test range in Rajasthan desert) too. So we did the test in the Bay of Bengal from the Andaman's and we conducted the flight tests. The land-attack missile was launched and hit the target, like a "bull's eye" well within five meters of range. This test also validated several other features of our missile. The very first feature was 'Way Point' and we took deviations in missile's path at pre-determined points to avoid populated areas and reach the designated target. We achieved that capability. 'Way Point' means the missile had taken an alternative route by avoiding the populated areas. Two way points were taken during the May 2015 tests. The missile followed a "text-book trajectory" and hit the target with pin-point accuracy. This was the weapon's number two capability. The third was that we lifted the missile from the mainland, from Northern Command, right up to the Andaman and Nicobar Islands. This proved that our missile system can be carried by an aircraft and can be deployed at a very short notice. That capability was also proved. Apart from that, the missile test was conducted by the users, the Army. We took part just as spectators and didn't even tell them how and what to do. We were only present there. The test firing was conducted completely by the Indian Army's Artillery Division in the presence of all of their senior officers. It was a moment of great achievement for BrahMos Aerospace and DRDO (Defence Research and Development Organisation) that our designed missile could achieve the target. For the Army, the range makes a lot of difference, because ours is a conventional, tactical missile. It should be able to pin-point and take on the target, be it a rail bridge or Road Bridge or a house in a crowded locality or an enemy hidden behind the mountainous region. So you want to take on the target very precisely and as of now, we don't see the armed forces having any missile system other than the BRAHMOS with such fine prowess. We proved that to our users and also gave a lot of confidence to the armed forces that by using the BRAHMOS system, they can defend the Nation, protect its safety and sovereignty. It is a milestone, a technological achievement. With this test, we proved what we have been telling them -- that this missile can go a long distance (of its full range) and hit the target. The steep dive is a sharp maneuver in a mountainous region and it can go over to the shadow area of a mountain to take out that target, practically a top-down attack. Is that the right understanding of what this missile can achieve? Yes, you are correct. One thing is, any cruise missile is very efficient and effective if you take on a target parallel to the ground or sea. But by going at supersonic cruise mode and then doing such a maneuver of taking on the target from the top is technologically very challenging. BRAHMOS is also a very potent weapon with the services, because the enemy won't know until the last moment that a missile is approaching. You have to make several changes in the software, control and guidance scheme and then tune the seeker in such a manner that it can achieve that capability. The guidance system also has to be very precise. There are so many redundancies in our guidance system - right from the INS, GPS, GLONASS and GAGAN. We made a provision for IRNSS too, which is going to be our Indian navigation system. So, it is a very satisfying machine as far as engineering is concerned. Is it real time guidance, as if you spot a target, it will be guided to it? Yes, you are right. It is a real time guidance by network centricity. Is this not there in the other variants of BRAHMOS? It is the users who decide what mission they want. This was the specific requirement of the Indian Army, which we have provided to them. Missile is nothing but software entity and to meet the software and physical requirements, you plug in various sub-systems. For ships, they usually say that if it is in horizontal mode, it meets the requirement. But for land, it sometimes requires to go in a cruise mode and hit the target in horizontal or vertical steep dive mode, or even have surround capability, which means it is able to go around the hill and hit the target. We are also working on this surround capability. In fact, our next target is to develop this near vertical and surround capability for the missile. It all depends on the missile. We would like to achieve this near vertical capability which will provide a different kind of capability to the users. We have achieved up to 70 degrees of steep-dive angle. Soon, we intend to have up to 90-degree steep-dive angle. It will be very effective once we achieve this near vertical capability for our weapon. This would be the longest range conventional weapon with the Army and an artillery weapon. It actually enhances the conventional range limitations of the Army, as it is usually said that the Army only tackles a 40-km range and this new range will change the concept completely. As a scientist, my aspiration and objective is to meet the user's requirements. Today, if the Army says they want 200-or 300-km, we provide that to them. Tomorrow, if they say 500-km, we will provide that. If they say 1,000-km, we can provide that too. As DRDO scientist, our job is to provide the capability to our users. It is for the Army, Navy and Air Force to make their own plan and we just plug into that. As scientists, our philosophy and objective is to provide the technological competence and muscle to the users. They said they wanted up to 300-km and we provided that to them. There is also Russia in this project and there are MTCR (Missile Technology Control Regime) limitations, so we understand the 290-km range. When we talk about the future of BRAHMOS, what are the possibilities? If your question is on scientific lines, then certainly we would like to provide more capabilities. We would like to go for different versions of the same missile. But about the range, we would like to strictly adhere to MTCR guidelines and all international treaties. India is having such an engineering capability that we don't foresee any problems in meeting any aspiration of the users.